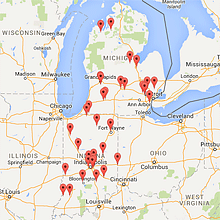 MacAllister Machinery is your local RoadHog dealer for Indiana and Michigan providing durable, high-performance road milling equipment designed to increase productivity. Our extensive selection includes a variety of tools and compact machines used for building, maintaining and repairing roads. We’re proud to offer premium equipment from a leading manufacturer that provides the latest innovations and technologies. RoadHog is a U.S.-based company focusing on delivering premium machine attachments used in a broad range of applications. Since launching in 1989, the RoadHog name has been synonymous with quality and innovation in developing new and unique products. As a full-service RoadHog dealer, MacAllister Machinery offers exclusive access to a complete lineup of new brooms, saws, cold planers, backhoes and skid loaders. 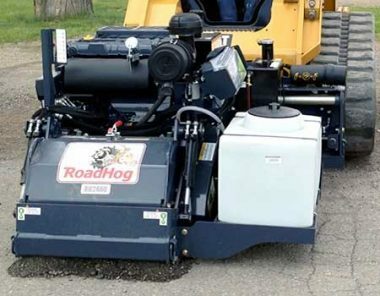 RoadHog attachments are widely used in road maintenance and construction, including reclaiming streets and shoulders, repairing potholes, soil stabilization, trenching and more. RoadHog Brooms: Our pickup brooms are made to last and perform in the most challenging applications. We carry RodHog brooms in 60, 72, 84 and 96-inch configurations that are ideal for sweeping industrial and commercial building parking areas, street maintenance and other pick-up jobs. RoadHog Saws: An essential tool for contractors and municipalities, saws come in 10-inch and 18-inch cut choices and 2.5-inch to 6-inch cutting wheels. RoadHog saws feature a proven-tested driveline and planetary reduction drivers for maximum power and efficiency. Cold Planers for Wheel Loaders: RoadHog hydraulic cold planers deliver exceptional wheel loader productivity and efficiency. We carry models with cutting widths of 12 to 48 inches, featuring electro-hydraulic control of depth, side-shift and tilt. Backhoe Attachments: Our selection of RoadHog products includes backhoe attachments for tractor loaders that reduce the need for traditional dedicated milling machines. Applications include small and medium-sized projects such as milling residential and city streets, parking lots and industrial complexes. Skid Steer Loader Attachments: Increase production rates with a RoadHog skid steer attachment that outperforms similarly sized hydraulically powered cold planers. Our skid steer loaders are a popular choice for fixing potholes, milling prior to overlay, and small stabilization and recycling projects. Learn more about RoadHog attachments. MacAllister Rentals provides access to RoadHog attachment rentals to meet your temporary needs. We offer daily, weekly and longer-term rentals for maximum flexibility. All of our RoadHog brooms, saws and other equipment are well-maintained and capable of tackling your toughest jobs. When you’re looking to add a piece of equipment to your fleet and buying new doesn’t fit the budget, a used solution from a reliable source is an economical alternative. MacAllister offers a variety of used attachments in excellent operating condition. You’ll find quality machines and attachments at a price that improves your bottom line. Choose MacAllister Machinery as your RoadHog dealer for the best selection of new, used and rental products in the region. Give us a call, contact us online, or find the location in your area to request additional information and assistance placing your order. Copyright © 2019 MacAllister Machinery Company, Inc. All rights reserved.